These predators are commonly found in storages. They are about 1/8” long and dark brown in color. Females lay approximately 150 eggs. Young pirate bugs (nymphs) start to feed as soon as the hatch. It takes about 16 days (at 30°C) to go from egg to adult. They live about 100 days and can survive up to 20 days without food or water. This is important for a predator if it has to wait between prey hatchings. Excellent predators, they are able to catch and kill prey 15 times its size. One advantage to their use in grain bins is that populations can survive cold temperatures during the winters. Despite subfreezing temperatures, live insects can be collected in grain bins, and when placed in warmer temperatures, they will start feeding. These predators have a high capacity to increase their numbers and to consume all available prey, or to reduce their numbers by cannibalistic behavior, thus reducing their own populations when prey are scarce. 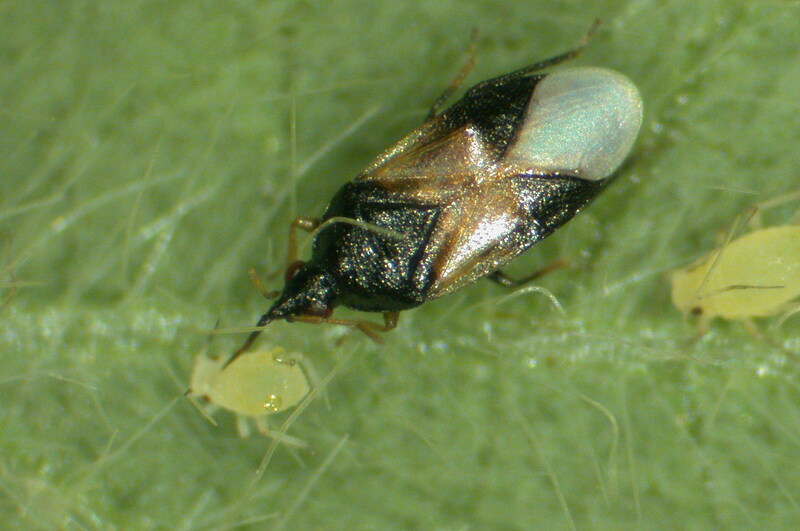 Unfortunately, they are incapable of penetrating hard material (seeds) to control internal infestors (weevils). Among its favorite prey are larval Indianmeal moth, Mediterranean flour moths, almond moths, red flour beetles, confused flour beetles, sawtoothed grain beetles and warehouse beetles.